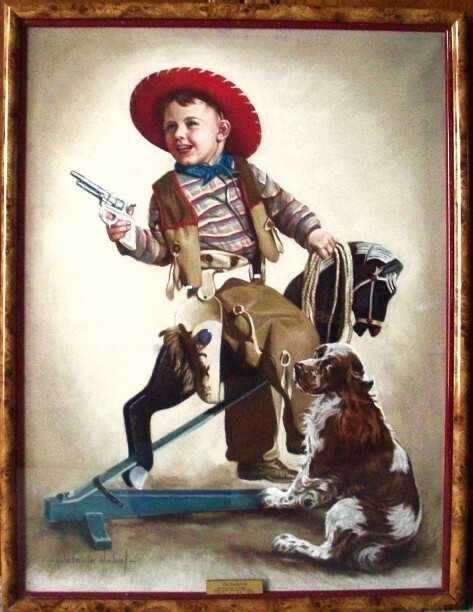 This pastel on canvas painting titled, "The Buckaroo" was created in 1935 by Adelaide Hiebel for the Gerlach Barklow Calendar Company. It is large, at 30 x 40 inches. This image was so popular in the 1930's that Gerlach Barklow also featured it in the 1952 calendar line. Many of her works have an "americana" theme, as she was especially talented at capturing images of what was going on in the country at the time. Adults of all ages can relate to this image, which inspires childhood memories.